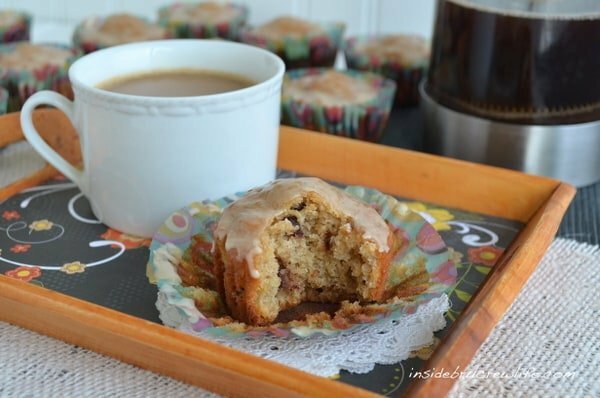 Soft fluffy muffins are great to eat with your morning coffee. These Chocolate Chip Oatmeal Muffins have a coffee glaze making them perfect for starting out the day caffeinated! Our kids absolutely love having a box of muffins on the counter that they can grab when they are rushing out the door for school or coming home after school. Muffins are so easy to make and have on hand for those morning munchies or snack attacks. 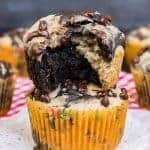 This fun muffin was one that I had the opportunity to try out when I was participating in a blog program where we made and adapted recipes from other bloggers. This particular blogger that I found this muffin from no longer blogs, so I can’t share where it came from. 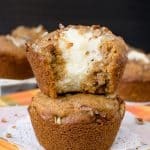 Recently I had a reader who made the recipe and had a few questions on the size of the muffins, so I went ahead and remade the recipes with a few changes. Plus, they taste like cookies in muffin form, and who wouldn’t want to eat cookies for breakfast??? I know our kids were enjoying my recipe testing. One thing that I noticed in the recipe from the previous years is that it only called for baking powder. Now normally this causes baked goods to rise. 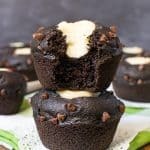 Over the years I have done much baking research and practicing in my kitchen and, I have found that if you actually use a mixture of baking powder and baking soda it can have better results in certain baked goods. Baking soda also aids in browning. Case in point…this muffin! See this picture above. My first batch (on the right) I only used baking powder for 18 muffins, but in the second batch (on the left) I did the mix of powder and soda for 15 muffins. The baking time stayed the same, but I am loving how much more the second batch rose. Fluffy golden muffins always make me happy! Now the muffins are delicious on their own, but I love adding a glaze to my baked goods. That might just be my sweet tooth talking, but I listened and kept the glaze action on the muffins. And for good measure, I also plopped a few more chocolate chips on top. More chocolate is never a bad idea, right? Ok, so maybe my jeans would argue with that one! 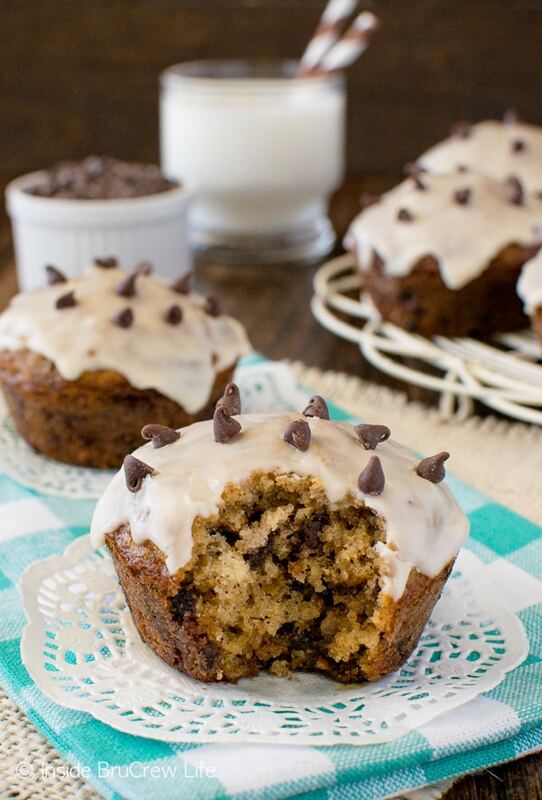 These easy Chocolate Chip Oatmeal Muffins taste like you are eating cookies for breakfast. A coffee glaze adds a fun caffeinated touch! Preheat the oven to 400 degrees. Spray a muffin tin with non-stick baking spray. In a mixing bowl, combine the oil and brown sugar. Add in the eggs and beat well. Sift together the oats, flour, baking powder, baking soda, salt, and cinnamon. Alternately add the milk and flour mixture to the bowl. Stir lightly until combined. Do not over mix. Add the chocolate chips and toffee bits and stir slightly. Spoon the mixture into the 15 prepared muffin tin cavities and bake for 18 minutes. Remove and let cool in the pan for 2 minutes, and then gently remove and place on a wire rack to cool completely. In a small bowl combine the powdered sugar and coffee. Spread on the tops of the cooled muffins. Sprinkle with extra mini chocolate chips, if desired. Let set. Store in a loosely covered container. I had Casey’s blog and she had mine also in the past. Agree with you, a great blog, and how does she keep up with everything? Jocelyn I was so excited to get your blog this month! I loved looking through all you pictures! The Chipotle Chicken Pasta was so incredible, it will definitely be a “do over” in our home! 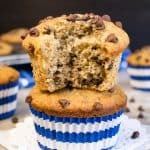 Your Chocolate Chip Oatmeal Muffins look so yummy, I can’t wait to try them! Thank you so much!!! That pasta is one of my all time favorites:-) I’m glad to hear you guys would make it again too!!! These look amazing, the perfect way to start off any morning. I will be making these soon! Happy SRC reveal day! BTW, I love your blog design. It’s adorable! 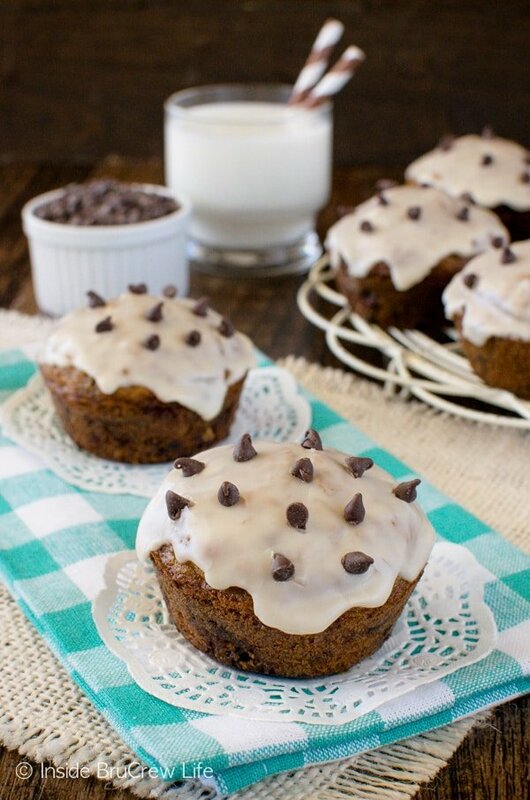 These look light a fantastic pumpkin spice latte in muffin form! The glaze is great addition. Also, it was very fun to hear about Casey’s blog. I didn’t get into running or cooking until years after high school. She has quite the head start and what a doll! Oh girl, these look so yummers! Love the coffee glaze! These look so yummy! And a coffee glaze… genius! Thanks:-) Glazes on anything really just make them that much better!!! Great way to start the day. Wish I could be enjoying one now. 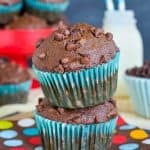 These muffins are seriously delicious looking!!! Wow. These look yummy! LOVE your new blog look! We go through a lot of muffins around here, so I am always looking for fun new varieties for the kids! They love muffins way more than cold cereal. Aw thank you so, so much for the kind post!! I’m so happy you gave this recipe a try! That post was way back when I first started blogging and my photos were a bit…”rough” to say the least. I love the idea of adding a glaze, brilliant! You are so sweet and I love how much you have accomplished so far:-) Keep it up girl!!! What a way to start the week & I love the glaze! Your site looks great!! LOVE your muffins…LOVE your new blog design! Did you say this will be your last SRC post? As in you won’t be part of this club anymore? Maybe I have misunderstood…I sure hope so! Thank you:-) You are so sweet! Yes, this is my last SRC post. I am trying to keep up with all my posts and this is one of the things that I have chosen to give up. But I will definitely be around checking out everyone’s posts. I love all the girls that I have met through this fun club!!! Oh my gosh, these are so yummy! 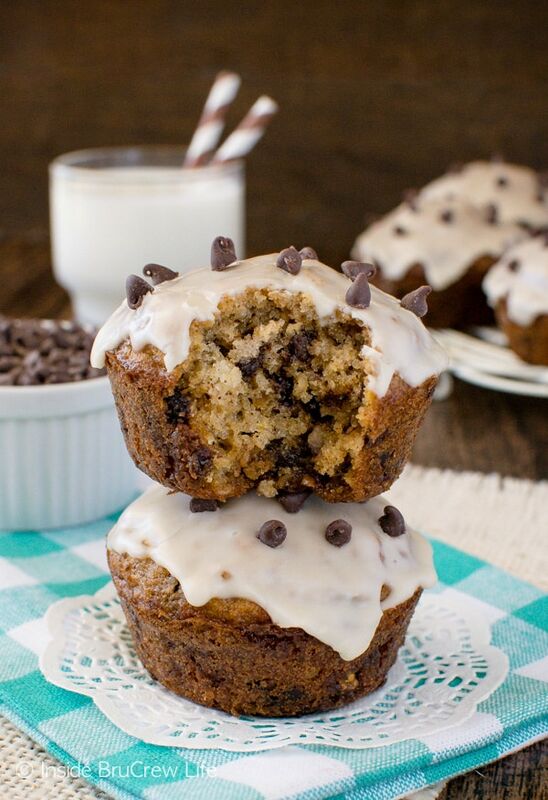 Like a cupcake for breakfast…but a muffin so it’s totally okay. I have to say, every time I pop over here, I’m loving your new look. It makes me smile. These muffins are going to make my kids smile. Look everyone’s smiling! And you made a cookie into a muffin, that makes my smile really big! YAY!!! This design makes me smile every single time I work on my blog:-) You just made my night by saying it makes you smile too!!! Cookies as muffins make me smile even more too!!! Yum, I love muffins for breakfast, and yours look absolutely amazing. Pinned it to try soon. 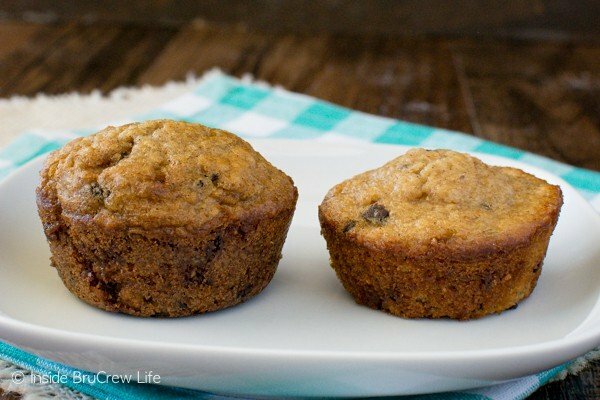 Muffins are one of my favorite breakfasts too! Thank you for the pin!!! Yum!! My boys would love these…actually they love anything with chocolate 🙂 Great SRC pick! YUM! What a great breakfast muffin. 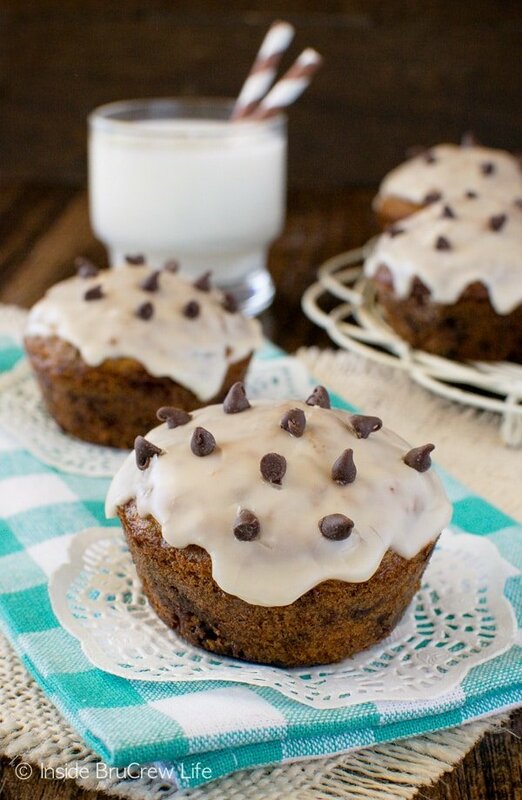 We love breakfast muffins at my house, and this looks like a great recipe! Love that first shot with the bite taken out–perfect! oh my gosh, this looks deelish. that icing just puts it over the top. yum!! Found you at Sumptuous Spoonfuls! These sound like GREAT breakfast muffins — thanks! My family will be so thrilled that I found your site. We love chocolate treats and this will we devoured in no time . They will either be thrilled or be in a sugar coma 🙂 LOL if you love chocolate and treats you have found the place to be. I am so happy to have you here!!! i know this is a late post but, how can i sub the flour with white whole wheat flour? Do you add the toffee chips with the flour mixture? It’s not indicated? Thanks! I am so sorry about that. I fixed the recipe for you. I always add mix ins right before filling liners. I hope you enjoyed the muffins! I don’t know how you got 24 muffins from this…they must have been pretty small. I made 12 normal size muffins and they didn’t even rise over the top of their muffin …cavity? Haha! Not sure what to call that… I subbed half the oil with applesauce and cut out 1/8 cup of brown sugar and the toffee bits. I also used unsweetened almond milk instead of cow milk and they came out to 226 calories each, with 9g of fat, 17g of sugar and 5g of protein. They are absolutely delicious!! 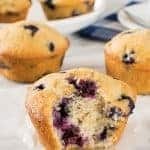 The recipe exactly as written (with 24 muffins) comes out to 300 calories each with 16g of fat, 25g of sugar and 6g protein. Gah! There was an error in my recipe calculator! I thought those numbers seemed really high! My bad! The recipe exactly as written (24 muffins) is: 184 calories each, 9g of fat, 15g of sugar and 3g of protein. Hi, Michelle. Thanks for your comment and question. In the original recipe I did make 24 muffins, and yes, they were smaller doing that many. Over the years I have learned a lot about baking and ingredients, so I remade the recipe the other day. I did make a few adjustments to the recipe and only made 15 muffins so they were larger. Of course, that is going to affect the calorie content, but I do not keep track of that stuff anyway. As far as calories go, I know that it is a common question I see on recipe comments. Since I have to count mine, (my baby is about to have her first birthday tomorrow and I still have not lost any baby weight! OOPS) I wanted to include that for others who might want to know. Take care and thank you for the awesome recipes! These had a baking soda flavour, I think next time I will try 3/4 tsp instead of a full tsp.